HOLLYWOOD – These nice, clean-cut kids from Utah, the Osmond Brothers, a shining example of the theory “The family that plays together stays together,” are making a very good thing out of going the wholesomeness route in show business instead of taking the “hippie” road. The boys have been out touring with Andy Williams on one night stands around the country this summer, returning to Hollywood in time to tape the fall Jerry Lewis Shows. Considered semi-regulars, The Osmonds are signed for 10 Lewis guest spots, while Nanette Fabray and Kaye Ballard will do four apiece. The kids also join discoverer Williams on his Christmas show and accompany him in concerts when not in conflict with Lewis TV dates. Last season the youngsters turned up in a couple of Lewis hours, harmonizing and working with Jerry in a silly Boy Scout sketch, and their warmth pleased the comic. Lewis can use smiling innocence in the background, so it’s a good move for both parties. Like Lawrence Welk’s sweet and pure Lennon Sisters, the Osmond Brothers are really performing for grownups, and they avoid long hair, crazy costumes and hippie protest songs which might put their audiences off. Using far-out harmonics taken from their barbershop quartet days, soft, pretty tunes and some “pop” numbers, the kids blend into Andy Williams’ family image, something that began back in 1961 on Andy’s first TV series. Discovered at Disneyland by the singer’s father, four cute little boys – Alan 11, Wayne 9, Merrill, 7, and Jay, 5 walked on camera in mid-season and charmed Andy with their cheerful sound and unspoiled country ways. On the early Williams shows, baby Jay, 5 at the time, was the scene stealer, singing to the camera as if magnetized by its red light, while the brothers faced the audience. This fall Jimmy will freewheel as the uninhibited tail end. 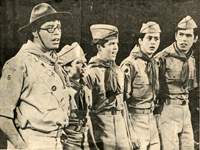 An army call, laryngitis or teenage voice changes have little effect on the group since talent can be switched at the last minute and new blood tapped from the family of nine. Some Osmond voices go way down then come back up, some skip a whole register in the tricky days and all keep working throughout. Leader Alan thinks it’s helpful to sing through voice changes and is against any vocal vacations. Each Osmond child is subjected to music by the time he can toddle, learning by osmosis, and all have relative pitch. Mrs. Osmond teaches the saxophone, then they can branch out into other instruments.